Let me start by saying this: Clemency Pogue will not be to everyone’s taste. It is not appropriate for young children for whom parody, word play and some gross slapstick-esque humor will not yet hit their mark. Clemency’s parents tell all manner of stories. Clemency listens and absorbs them all. When her parents go off to work as usual one day Clemency occupies herself as usual with a trip into the forest where she becomes the victim of a sudden and persistently vicious attack by an evil fairy. Remembering her father’s recent tale of Peter Pan, Clemency repeatedly shouts that she does NOT “believe in fairies.” When the nasty little fairy drops lifeless into a gorge Clemency is relieved–at first. The almost immediate appearance of a hilariously disgruntled hobgoblin named ChafesMeSo with the news that Clemency’s actions have resulted in far-reaching deadly consequences throughout the fairy realm deflates Clem’s breath of success. With admirable determination Clemency and ChafesMeSo set off on a journey to restore the balance and lives Clem accidentally destroyed. One part magic and fantasy, one part belly-laugh adventure and one part ‘do the right thing’ Clemency Pogue made me laugh out loud and left me smiling. The fact that the consequences of Clem’s actions resulted in both fortunate AND unfortunate circumstances in their own situations and settings adds a deeper and more interesting dimension to the plot. 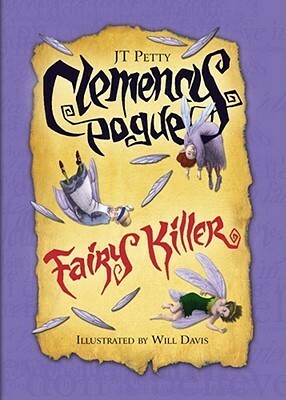 Readers ages 9-12 will thoroughly enjoy Clemency Pogue: Fairy Killer–probably for the same reasons it is inappropriate for younger readers. Adults–like myself–who appreciate and enjoy wicked parody and wordplay intertwined around a solid plot and characters (Think Roald Dahl tales like Matilda and The Witches.) will happily devour this short, easy read.